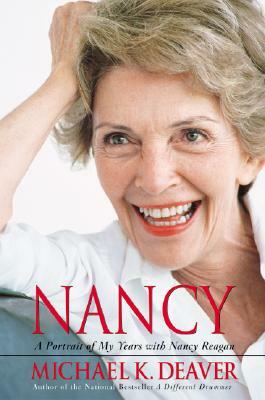 Candid, moving and insightful, Nancy is the most personal look at Nancy Davis Reagan ever published. She was the daughter of a single mother. She was a Hollywood movie star. She is the wife of one of the greatest presidents of the twentieth century. She is a cancer survivor. And she now wages her greatest, unwinnable battle -- against her husband's Alzheimer's disease. Nancy Davis Reagan has led an extraordinary life; it has also been an extraordinarily private one. Now Mike Deaver, whose relationship with Mrs. Reagan dates back to the 1960s, shares the side of Nancy that only her intimates know. Most people don't know the real Nancy Reagan, or their impression of her has been shaped by consistently negative press coverage. If you believe the mainstream press, all you would really know about Nancy is that she likes fancy clothes or that she has rich and powerful friends or that she was obsessed with trivialities like the White House's china. Pundits were equally tough on her, crowning her with ugly nicknames, the tamer ones being Queen Nancy, Iron Lady, Ice Lady, and Dragon Lady. But the Nancy Reagan Mike Deaver has come to know over thirty-five years, the woman portrayed in Nancy, is far more complicated than the stereotype. No cardboard cutout, she is pure flesh and blood, a woman of immense will and fortitude. And in the Reagans' fifty-year marriage, Ron always received top billing, and she would have it no other way. She is convinced that her husband was one of the great men of the twentieth century -- a rare world leader who changed the tide of history. Still, Nancy has been no bit player in the story. Deaver believes that Reagan would not have risen to such distinction without Nancy at his side. Reluctantly drawn into politics, the retired actress and housewife was at first intimidated, but then gradually embraced her role. To the president who was incapable of protecting himself from those who served him poorly and even wished him harm, Nancy Reagan would bring discipline. When it would come time for a momentous life decision, to wage a campaign for the White House, she would ask the tough questions. When his image might be tainted, she would fervently guard it, even at the expense of her own. To Ronald Reagan the man, who always had trouble expressing intimacy, Nancy gave the gift of her unrestricted love. She was his respite, his comfort, his reward at the end of the day. Whenever she left him to travel, the leader of the free world was anxious as a schoolboy until she was safely home again. Now to a man no longer capable of looking after himself, Nancy is everything there is left to be: care-taker, guardian, nurturer of the Reagan legacy. Description: Deaver,Michael K. Nancy: A Portrait Of My Years With Nancy Reagan Light edge/ corner wear to dust jacket/ book. Light creases to dust jacket spine/ cover. Pages clean. Binding tight. All U.S. orders are shipped with tracking number and email confirmation. All Orders Shipped With Tracking And Delivery Confirmation Numbers.